Millennium Aircraft Services team is comprised of both technical aircraft sales consultants and maintenance engineers. Backed by in-house flight operations staff and avionics technical specialists, Millennium Aircraft Services has first-hand access to, and knowledge of, the aircraft marketplace unmatched by any other broker or acquisition organization. These resources provide insight into desired options, upcoming mandates, maintenance forecasts and business relationships. AmericaTowne® Tourism Development and Trade Centers provide unique one of kind communities for people in China to go spend their leisure time consisting of 50 unique USA small businesses, a 5 star hotel, 50 villas and a theme park all fashioned after the American way, business, and life style. Actual businesses, hotels, villas and theme parks found in the USA can be found in AmericaTowne® Trade Centers in China. Over the next 10 years, with the support of USA Exim Bank, the private sector and the Chinese Government, we will meet demand by Chinese consumers for leisure and exports, by building 10 AmericaTowne® Tourism Development and Trade Centers across China at a Cost of $151 million per Center having a total direct investment of $1.5 Billion dollars. We anticipate each center to be located on 1,000 mu. We expect to commission the Zhou Brothers (the internationally known Chinese American artists) to create an original major sculpture identifying each Center and tying each Center to a theme that focuses on US and China culture and attributes from the surrounding Community. The Centers will create jobs and business opportunities in China and the USA. As a result of the USA based company and Centers, over 500 new businesses; 10 hotels; 500 villas and 10 theme parks will be created, employing directly and indirectly 36,500 people in China and the USA. It is expected that the USA based Company and Centers will generate over $1.5 Billion in labor income and have a direct total economic benefit of approximately $5 billion. AmericaTowne® with the support of the City of Chizhou is opening an Import Trade Center in China. 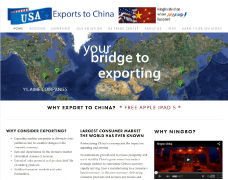 The Center imports “made in America” goods and services into China. The Center’s purpose is to build a long-term foundation helping US small businesses provide their products to China’s middle and upper income consumers while increasing jobs in the US.